The guacamole and the chips are not in the burger, but they are slathered on the bottom bun and the burger is set on top of all of this yummy stuff. We went to a restaurant a while ago that was supposed to have the best burgers in town. We don’t go out to eat too often so when we do I always tell myself that I will order something that is new to me, but when I get the menu and see one of my favorite things to eat, I end up ordering it. Mike on the other hand is likely to order something that he has never had before. He is a bit braver than what I am or maybe a bit more adventurous. Hopefully I can be more like that someday. You got it, Mike ordered this burger that had the guacamole and tortilla chips on it. I was a little skeptical. I was sure that I would love the guacamole on the burger, but I was not too sure on the tortilla chips. He fell in love with the burger. We decided to recreate the burger at home. 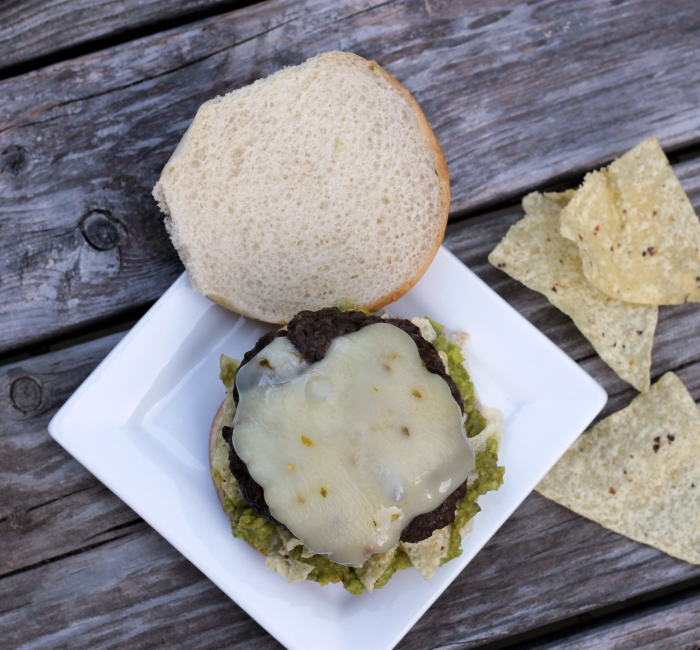 We broiled the burger and once they were done, the bottom of the buns were slathered with guacamole and topped with crushed tortilla chips, the burger has a slice of pepper jack cheese melted on top of it. All the flavors come together for one delicious burger. But make sure that you have a couple of napkins handy, they are a bit messy. Oh, are you wondering what burger I had that evening? I had my favorite mozzarella with mushrooms. And by the way they were one of the best burgers that I have ever eaten. Season the ground beef with salt and pepper to taste. Form into 5 to 6 patties. Cook them the way you prefer. Top with the pepper jack cheese, let the cheese melt. 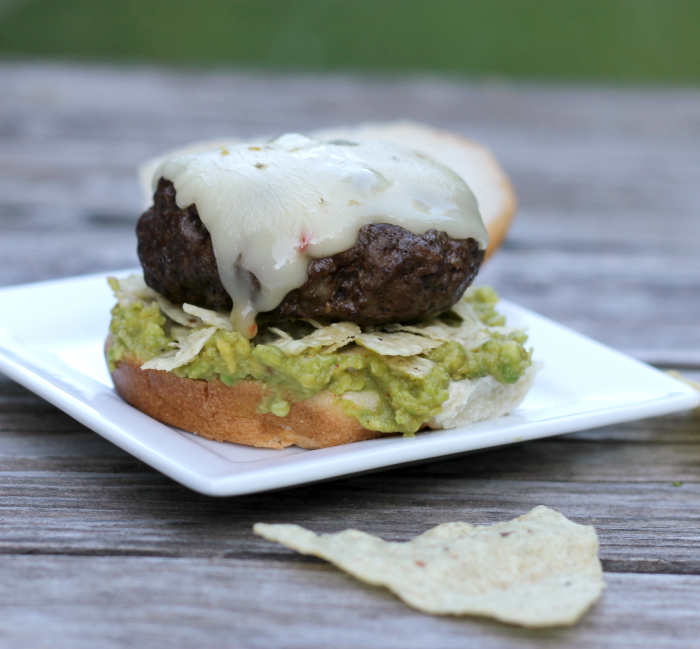 Slather the bottom part of the bun with guacamole, top with the crushed chips, top with the burger and cheese, and set the top of the bun on the burger. This is like a fiesta in burger form! I love this idea. I am always happy when I have a mixture of textures in my meal. 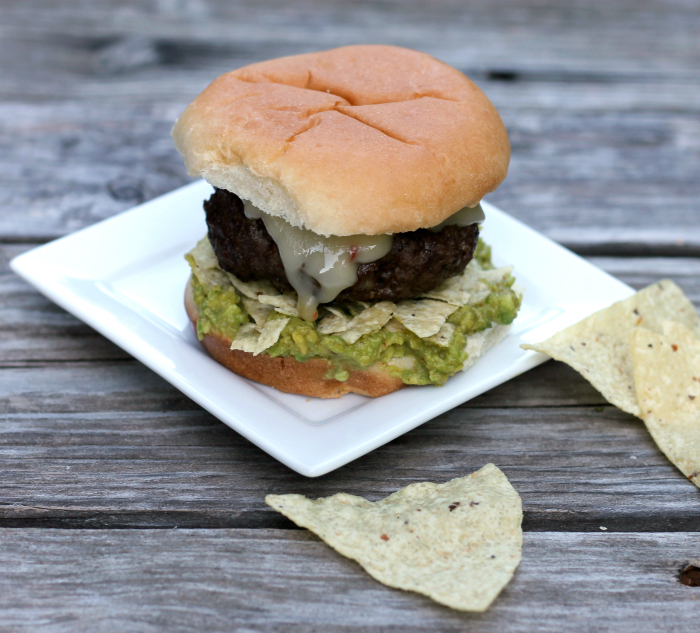 The crunchy chips with the creamy guacamole burger sound amazing together. I love that you recreated this! I have a similar burger on my blog – I LOVE it! One of my all-time favorites. I put taco seasonings in my burger for extra flavor. What an outstanding idea! 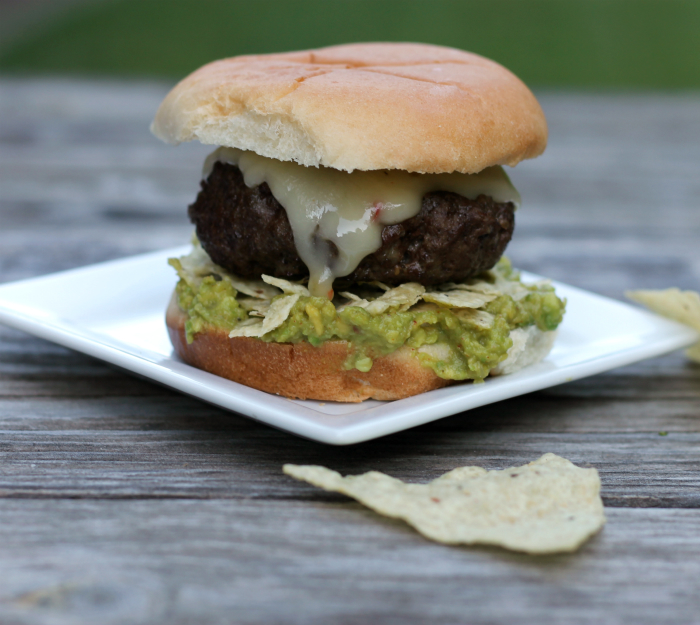 I adore guacamole, so I really need to make some for my next burger! !